Hedsor Jazz is a regular Thursday night gig run by Geoff Cronin at the Hedsor Social Club in Bourne End in Bucknghamshire. It has been running for thirteen years. Clive Burton trombone, Mike Wills reeds, Martin Hart drums, Ken Rankine bass, and Nigel Fox keyboard. Stuart Henderson and featuring Simon Spillett with the Music of Tubby Hayes. Steve Waterman trumpet, Ken McCarthy keyboard, Ken Rankine bass and Mike Jeffries drums. 7.45 pm The Simon Spillett Quartet with John Critchinson keyboard, Alex Dankworth bass and Clark Tracey drums. 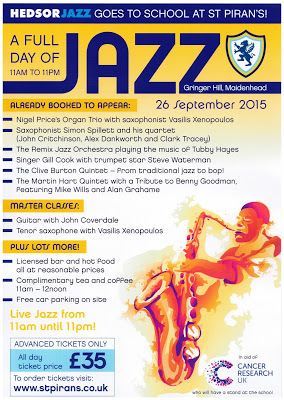 Nigel Price guitar Pete Whittaker organ, Matt Home drums with Vasilis Xenopoulos on tenor sax. Bar and hot food available on site. Tickets £35 in advance from www.stpirans.co.uk or on the door on the day.